Wagner's Kundry is partly based on Wolfram's Condrie, the High Messenger of the Grail but as Wagner states in his Prose Draft his Kundry is also a female variant of the archetypal Wandering Jew. 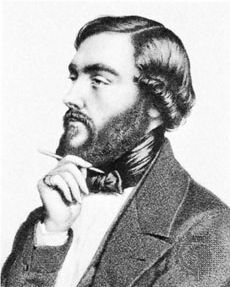 Left: Eugène Sue, engraving by Fuhr. his (masculine) archetype has been found in poems and stories since the thirteenth century. The first literary record of the doomed wanderer is found in the Flores Historiarum , a chronicle of Roger of Wendover, a monk of St. Albans (d. 1237). That account was then incorporated with some slight amplifications into the Historia Major of Matthew Paris (d. 1259). The legend owes its fame and popularity to an anonymous German chap-book which appeared in 1602 under the title: Kurtze Beschreibung und Erzählung von einem Juden mit Namen Ahasverus. There the story is related on the authority of a Lutheran clergyman, Paulus von Eitzen (d. 1598), who claimed to have met the Jew in person. Suddenly, through the shadow thrown by the overhanging wood, which stretches far into endless depths, a human form appears. It is a woman. She advances slowly towards the ruins. She has reached them. She treads the once sacred ground. This woman is pale, her look sad, her long robe floats on the wind, her feet covered with dust. She walks with difficulty and pain. A block of stone is placed near the stream, almost at the foot of the statue of John the Baptist. Upon this stone she sinks breathless and exhausted, worn out with fatigue. And yet, for many days, many years, many centuries, she has walked on unwearied. For the first time, she feels an unconquerable sense of lassitude. For the first time, her feet begin to fail her. For the first time, she, who traversed, with firm and equal footsteps, the moving lava of torrid deserts, while whole caravans were buried in drifts of fiery sand -- who passed, with steady and disdainful tread, over the eternal snows of Arctic regions, over icy solitudes, in which no other human being could live -- who had been spared by the devouring flames of conflagrations, and by the impetuous waters of torrents -- she, in brief, who for centuries had had nothing in common with humanity -- for the first time suffers mortal pain. Her feet bleed, her limbs ache with fatigue, she is devoured by burning thirst. She feels these infirmities, yet scarcely dares to believe them real. Her joy would be too immense! But now, her throat becomes dry, contracted, all on fire. She sees the stream, and throws herself on her knees, to quench her thirst in that crystal current, transparent as a mirror. What happens then? Hardly have her fevered lips touched the fresh, pure water, than, still kneeling, supported on her hands, she suddenly ceases to drink, and gazes eagerly on the limpid stream. Forgetting the thirst which devours her, she utters a loud cry -- a cry of deep, earnest, religious joy, like a note of praise and infinite gratitude to heaven. In that deep mirror, she perceives that she has grown older. In a few days, a few hours, a few minutes, perhaps in a single second, she has attained the maturity of age. She, who for more than eighteen centuries has been as a woman of twenty, carrying through successive generations the load of her imperishable youth -- she has grown old, and may, perhaps, at length, hope to die. Every minute of her life may now bring her nearer to the last home! Transported by that ineffable hope, she rises, and lifts her eyes to heaven, clasping her hands in an attitude of fervent prayer. Then her eyes rest on the tall statue of stone, representing St. John. The head, which the martyr carries in his hand, seems, from beneath its half-closed granite eyelid, to cast upon the Wandering Jewess a glance of commiseration and pity. And it was she, Herodias who, in the cruel intoxication of a pagan festival, demanded the murder of the saint! And it is at the foot of the martyr's image, that, for the first time, the immortality, which weighed on her for so many centuries, seems likely to find a term! O, impenetrable mystery! oh, divine hope!" she cries. "The wrath of heaven is at length appeased. The hand of the Lord brings me to the feet of the blessed martyr, and I begin once more to feel myself a human creature. And yet it was to avenge his death, that the same heaven condemned me to eternal wanderings! Eugène Sue, Le Juif Errant, Chapter 50.
n the second act of Wagner's music-drama, Klingsor reminds Kundry that she was, in a former life, Herodias. Just as Ahasuerus had turned away the suffering Jesus from his door, so (we can infer) did Herodias laugh at Christ bearing his Cross. As a result, she is forced to repeat her accursed laughter . he philosopher Schopenhauer called Schadenfreude (malicious joy, taking pleasure in the sufferings of others), the worst trait in human nature. It is the exact opposite of compassion. But the worst trait in human nature is always that malicious joy at the misfortune of others, for it is closely akin to cruelty and in fact really differs from it only as theory from practice. It appears generally where sympathy should find a place, for this, as its opposite, is the true source of all genuine righteousness and loving kindness. In another sense, envy is opposed to sympathy, in so far as it is called forth by the opposite occasion; and so its opposition to sympathy is due primarily to the occasion and only in consequence thereof does it appear in the feeling itself. Therefore, although reprehensible, envy is nevertheless excusable and generally human, whereas that malicious joy is devilish and its mockery the laughter of hell. Arthur Schopenhauer, Parerga und Paralipomena, volume 2, chapter 8, section 114.
n addition to Sue's novel, there can be no doubt that Wagner was inspired by Heinrich Heine's Atta Troll of 1841, in which the character of Herodias corresponds to Wilde's Salome (1893). In contrast to earlier treatments of the story by Heine, Flaubert and others, Wilde shifted its focus from mother to daughter. Heine described his Flying Dutchman as the Wandering Jew of the sea and as such, the Dutchman can be seen as a parallel to Kundry. t should be noted that Wagner's association of the Dutchman and Kundry with the archetype of the Wandering Jew does not mean that he thought of these characters as Jewish, nor that he intended his audience to think of them in that way. Nowhere in the libretto of Parsifal, nor in Wagner's writings, nor in any recorded statement by Wagner, does he refer to Kundry as belonging to the Jewish race or religion, or indeed to any race or religion. She is a heathen, beyond doubt, not sharing the faith of the Grail community, but we are not told about her religious beliefs, if any. Klingsor calls her, in the same sentence, both Herodias and Gundryggia, names that suggest a Semitic and a Nordic existence respectively. Therefore Kundry belongs to no specific race; in her various lifetimes she has belonged to many different races. s Kundry the biblical Herodias (ca. 15 BC to after 39 AD), perhaps? We are not told, although it is a reasonable assumption. Her account of laughter at the suffering of one whom we can assume to have been Jesus (his name is never mentioned) suggests that Kundry remembers an existence from that time, when she lived in Judea. Perhaps she was the biblical Herodias, the Hasmonean princess of Judea (wife of Philip son of Herod the Great, then of his half-brother Herod Antipas). In summary, everything about Kundry is ambiguous. ince writing the notes above, I have found in Jessie L. Weston's Legends of the Wagner Drama an account of a tradition -- Weston called it a weird story -- behind Heinrich Heine's Atta Troll with a reference to Herodias that might have been known both to Heine and to Wagner.